The Spinlock Deckvest™ 5D is a lightweight, high-performance Life Jacket and Safety Harness Combo for all offshore activities. The Spinlock Deckvest™ 5D is ergonomically designed to sit on the shoulders and neck comfortably while keeping out of the way of your arms and waist for full freedom of movement. This inflatable life jacket turns unconscious wearer’s face up and effectively keeps your head above water while the integrated sprayhood protects against secondary drowning. Offering a multitude of safety features as well as comfort, Spinlock’s Deckvest™ 5D keeps you moving safely and quickly on your boat. The Deckvest™ 5D is designed to automatically inflate only when water flows upward through the unit, compressing a paper capsule that dissolves when wet, which releases a spring and then punctures the CO2 cylinder. This means that the life jacket will not inflate prematurely due to ocean spray or rain running down it. Manually inflate your life jacket with the pull handle on the front and once inflated you can add or release air with the oral inflation tube. Rearm your Deckvest™ 5D with the Spinlock Deckvest™ Rearming Kit (sold separately). 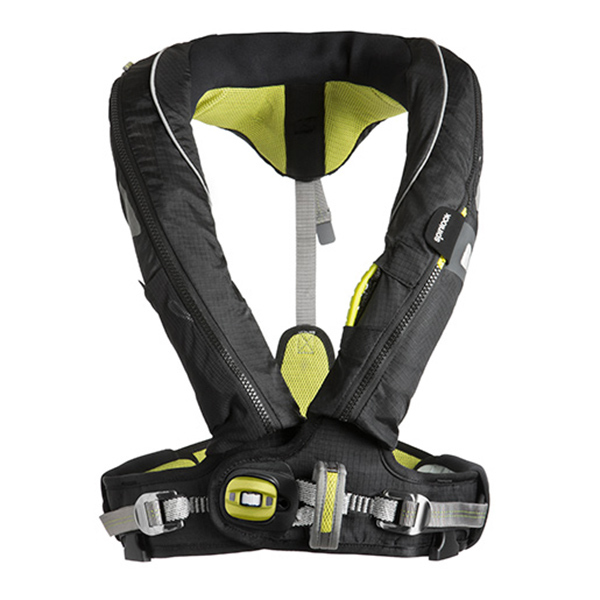 Spinlock integrated a deck safety harness into this life jacket as well as a high-tensile Dyneema reinforced attachment point for a safety tether (sold separately). Inflatable life jackets are designed to be lightweight and low profile offering maximum mobility. Spinlock took this feature one step further with its ergonomically designed straps that comfortably sit on your shoulders. A unique back strap adjuster keeps the life jacket secure and off of your neck so you can wear this life jacket for extended periods of time without noticing it. This life jacket sits high on your waist offering complete freedom of movement while you move quickly about your vessel. Constructed from highly durable polyamide material, the Deckvest™ 5D is expertly made and will sustain wear in extreme conditions. With dual front adjustments and the unique back adjustment, you get a secure fit at all times. The SOLAS approved, auto-activating, Pylon Light™ is a LED strobe light that sits on a 23-centimeter antenna so that it shines above your head and the water in an emergency. The protective sprayhood keeps your airways clear from spray and waves in the event you fall in the water and protects you from secondary drowning. The life jacket bladder features Spinlock’s Lume-On™ lights providing illumination in hazy conditions. An emergency whistle and lifting strop are attached to the bladder for added safety. Additional features include an emergency safety line cutter, an outer mesh pocket for storage and two crotch straps for a more secure fit. * Designed and approved to ISO 12402-3 safety standard. ISAF and US Sailing approved.